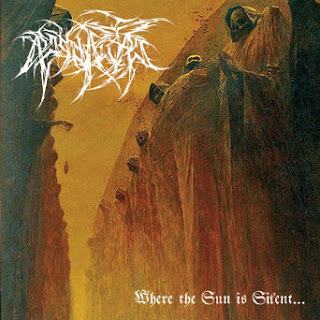 Ashdautus where a band from California that played a very dark form of raw and primitive black metal with atmospheric and melodic elements that had a depressive feeling to them and this is a review of their 2007 album "Where The Sun Is Silent" which was released by Full Moon Productions. Drums range from slow, mid paced to fast drumming with some blast beats being thrown into the music at times, while the bass playing has a very strong and powerful tone with riffs that dominate throughout the recording. Rhythm guitars range from slow, mid paced to fast black metal riffs that are very dark, raw and primitive sounding with some atmospheric and melodic elements in addition there are some post black metal elements utilized why not sounding mainstream along with a good amount of distorted parts while the lead guitars are very distorted and melodic sounding black metal guitar leads that dont really turn into guitar solos on this long 25 minute song. Vocals range from high pitched to depressive black metal screams and cries, while the lyrics are written in a four part installment with themes that cover Black Twilight, Dissonance, Chaos, Crime and Drugs, as for the production it has a very dark, raw and primitive sound while you can still hear all of the musical instruments that are present on this recording. In my opinion Ashdautus where a very great sounding raw and primitive atmospheric depressive black metal band with a post black metal edge and if you are a fan of this style, you should check out this album. RECOMMENDED TRACKS INCLUDE "